Neil Thomas Proto’s public service and private practice in law includes forty five years of experience in land use, environmental and federal litigation, teaching at Yale University and Georgetown University, and writing and speaking on a broad range of cultural and legal matters. As a law student at The George Washington University, he chaired Students Challenging Regulatory Agency Procedures (SCRAP), which resulted in the first United States Supreme Court decision to consider the National Environmental Policy Act (1973). His memoir, To a High Court: The Tumult and Choices That Led to United States of America v. SCRAP, was published in 2006. In the winter of 1973, Mr. Proto joined the United States Department of Justice as an appellate attorney in the Land and Natural Resources Division. He briefed and argued cases involving public lands, Native Americans, and the environment in United States Courts of Appeals. He is the recipient of the Department of Justice Special Commendation Award for Outstanding Service and the Environment and Natural Resources Division Award for Meritorious Service. He returned to New Haven in 1979 to engage in its civic life. 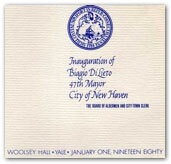 In January 1980, Mr. Proto served as chair of the inauguration of Mayor Biagio DiLieto, the first such inauguration held on the Yale campus in the more than 300-year history of the city and the university. The inauguration included the president of Yale, A. Bartlett Giamatti, and Conncticut Governr Ella Tambussi Grasso. In the fall of 1981, Mr. Proto returned to Washington, D.C., where he served as general counsel to the President’s Nuclear Safety Oversight Committee. Its purpose was to examine and make recommendations concerning the problems and future of nuclear power plant safety following the accident at Three Mile Island. The committee was chaired by Arizona Governor Bruce Babbitt. Mr. Proto also received the Distinguished Alumnus Awards from Southern Connecticut State University in 1981. From 1983 to 1989, Mr. Proto returned to New Haven and entered private practice. He sat on the Board of Directors of the Shubert Theater and Long Wharf Theatre in New Haven. He also was appointed a visiting lecturer at Yale College in 1988 and 1989. He returned to Washington, D.C., in the fall of 1989 to enter private practice and to begin teaching at Georgetown University’s Public Policy Institute. In private practice, Verner Liipfert (1989-2003) Schnader Harrison (2003-2013), Mr. Proto also represented, pro bono, Protect Historic America-a group that included Pulitzer Prize-winner Nick Kotz and historians David McCullough and James McPherson-in its effort to stop Disney from locating a theme park in the Virginia Piedmont. In 1993, Mr. Proto drafted a unique statutory scheme at the behest of the state of Hawaii that resulted in th conveyance of Kaho’olawe Island from the United States to Hawaii for the special use of Native Hawaiians. He continued to represent Hawaii in its dealings with the United States through 2013. Mr. Proto remains an adjunct professor at Georgetown University’s McCourt Public Policy Institute. He has developed and taught interdisciplinary courses on environmental values, energy choices, urban policy, sprawl, and global warming and corporations and the history and law of nuclear power. In 2002, he served as chair of the city of New Haven’s Committee for the Commemoration of the Seventy-Fifth Anniversary of the Execution of Bartolomeo Vanzetti and Nicola Sacco. He also co-adapted from the original Dutch (with director Tony Giordano) the musical drama, The American Dream, The Story of Sacco and Vanzetti (performed at the Shubert in April 2002). In July 2004, Mr. Proto was elected to the Board of Directors of the Franklin and Eleanor Roosevelt Institute (Hyde Park, New York), for a three year term. He had served on the original Advisory Board of the student- created Roosevelt Institution before its merger with the Roosevelt Institute. He serves as chair (since 1995) of the American Friends of Wilton Park, a British-American educational organization with origins in World War II. In April 2010 he served as a senior advisor to the United States Naval Academy’s Foreign Affairs Conference on “National Security Beyond the Horizon: Changing Threats in a Changing World.” In August 2010 he was elected a Fellow in the Royal Geographical Society of London. Mr. Proto received his bachelor’s degree from Southern Connecticut State University in 1967, a master of arts in international affairs from the Elliot School at The George Washington University in 1969, and his juris doctor from The George Washington University in 1972. He is a member of the United States Supreme Court, and District of Columbia. Mr. Proto was born in 1945 and was raised in New Haven, Connecticut. He attended public schools, and was among the early recipients of college funding from the New Haven Scholarship Fund. His mother, Celeste Maria Proto, immigrated to the United States in 1916 at six years old with her mother Giacinta Ferrara, a sewing teacher. Celeste was born in Ripacandida, a small village atop a hill in the province of Potenza (Basilicata). She traveled in steerage aboard the S.S. Dante Alighieri. Celeste’s father, Tommaso, arrived in the United States a year earlier. His family was from Ortona, on the Adriatic Coast. He was a cabinetmaker and wood craftsman. Mr. Proto’s father, Matthew, was born in the United States and was one of seven children. His parents, Christopher and Theresa Lauro Proto, arrived in the United States in 1891 from the hillside village of Atrani on the Amalfi coast. Mr. Proto’s body of work includes, among others, writings and talks on nuclear power, space exploration, Native Americans, Native Hawaiians, federalism, urban sprawl, and presidential decision making. Proto, Neil Thomas. The Rights of My People, Liliuokalani’s Enduring Battle With The United States, 1893-1917, Algora Publishing: New York (2009) see www.RightsofMyPeople.com. Proto, Neil Thomas. To a High Court: The Tumult and Choices That Led to United States of America v. SCRAP. Lanham, Md. : Hamilton Books (a member of Rowman and Littlefield Publishing Group), 2006. Available at www.toahighcourt.com.